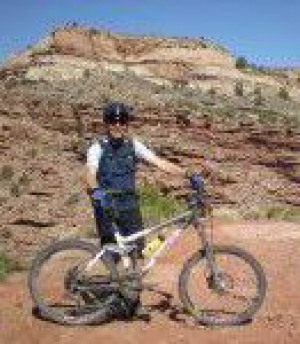 Five years removed from two major surgeries that would slow most people down, Chris Callahan conquered the legendary 142 mile Kokopelli mountain bike trail that winds from Fruita, CO to Moab, UT. A lifelong mountain biker, he credits Resurgens Orthopaedics—the largest orthopaedics practice in Georgia—with not only keeping him on the bike, but allowing him to still ride at such a high level. Callahan underwent two procedures at Resurgens with two different doctors: Dr. Erroll Bailey performed his Achilles repair and Dr. Evander Fogle tackled his arthroscopic knee repair. Physical therapist Shannon Marshall oversaw Callahan’s rehabilitation through both procedures. Dr. Bailey was the first Resurgens doctor to work with Callahan back in 2008. Presenting with a torn Achilles tendon, Dr. Baily recommended that Callahan undergo a surgical repair. After a successful surgery and a relatively quick recovery, Callahan returned to Resurgens once more—this time visiting Dr. Fogle for a gradually sustained injury to his knee on the opposing leg. Having been told by several other doctors that a full knee replacement was his only option, Dr. Fogle was the first to propose the less invasive, arthroscopic repair for Callahan’s case. As an avid outdoorsman with a life-long passion for mountain biking, Callahan had been concerned about the full-knee replacement approach, knowing it would come with severe limitations to his physical abilities and a long recovery period. Once again, Resurgens provided Mr. Callahan with a successful procedure and he was quickly on the road to recovery. Callahan said that the care he received from Dr. Bailey, Dr. Fogle, and Ms. Marshall, beginning to end, made all the difference in his healing process. Fast-forward about four years and Callahan is as active and healthy as ever, evidenced by completing the torturous Kokopelli Trail. Known for its widely varying terrain and elevation, as well as its intense downhill sections and steep climbs, the trail is ranked as ‘difficult’ on both aerobic and technical levels. Easily being the oldest rider on the trail, Callahan’s completion of the ride is a testament to both his personal skill and full recovery from his previous injuries. Read his story in The Southern Bicycle League Magazine located on pages 18 and 19.